Mickey Mouse has been around since 1928 and in his long history on film, he’s always been as cute as a button. From his first appearance in Steamboat Willie to that magical time when you could see in wearing a pointy blue wizard hat! From all the adventures he’s been roped into (like all those wacky Kingdom Hearts video games), all the way to his latest appearances in cartoons today, he’s always showing off his adorable side (not too bad for a mouse that’s pushing 90 years old). And everyone knows his name, even your little one who’s been around for a lot fewer years than the Disney icon. That’s why your child will smile from ear to ear when you get them all dressed up in this Mickey Mouse costume! If your child is just as adorable as Mickey Mouse, or if he loves the Disney character, then it might just be the perfect outfit for your little guy. It gives your baby the unique opportunity to become the cutest and most well-known character ever made. This Disney Mickey Mouse Baby Jumpsuit quickly transforms your child into a cartoon icon. The costume comes with a comfy black jumpsuit that has a pair of red shorts attached to the bottom. Giant oversized buttons on the waist add to the cartoonish look, but that’s not even the best part! The best part of this outfit has to be the hood, which has Mickey’s happy little face printed on the top. 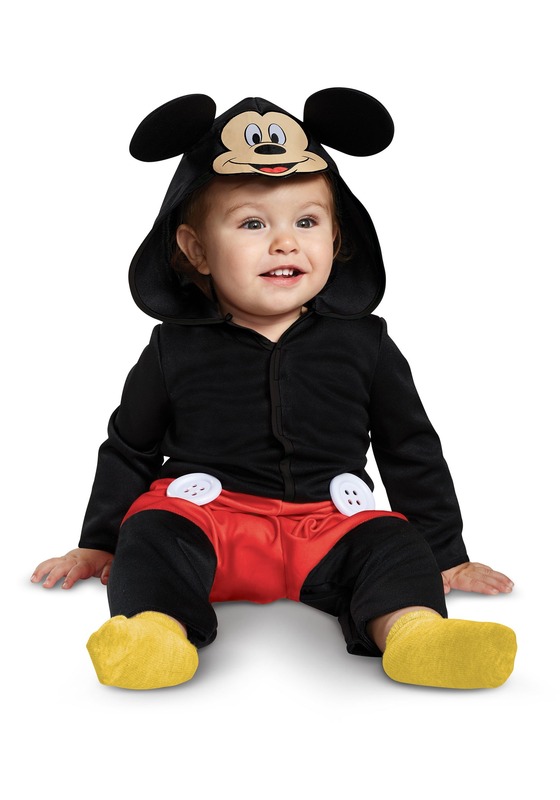 Once you have your little baby in this Mickey Mouse jumpsuit, he’ll be the star of the show! You can even turn it into a full family affair by checking out some of our adult Disney costumes to create the perfect parent and child duo costume.